For 20 years this year, TRAID has worked to tackle and solve the problems caused by making, consumption and disposing of clothes. It has done this practically, by providing easy ways to reuse clothes, and by raising awareness of the powerful environmental and social benefits of reducing our clothing footprint. At the same time TRAID supports those who make our clothes: working with cotton farmers to grow organically, retailers to eliminate child labour in supply chains and many more. Since 1999, the charity has put 50,462 tonnes of clothes and shoes back into use, directly educated 135,913 children, young people and adults on sustainable consumption and committed over £64,000,000 to its charitable objectives. I speak to Maria Chenoweth, CEO since 2003, about the charity’s work and ask what still needs to be done. Tell me about the birth of Traid - 20 years ago! TRAID launched in 1999 with an aesthetic that immediately set us apart from what was then a staid image of charity retail. Charity shops were associated with older shoppers, but we wanted TRAID’s brand to have youth appeal. 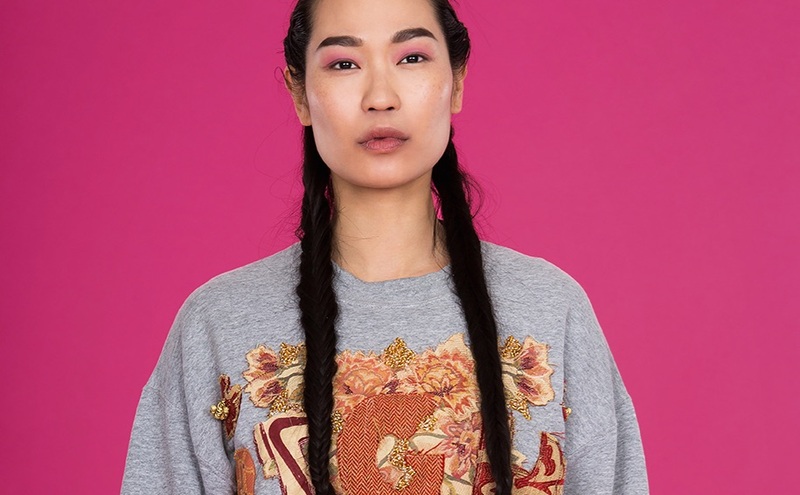 The bold identity we created and our gloriously diverse second-hand fashion loving staff really helped us to find our niche and establish ourselves as something new in the sector. 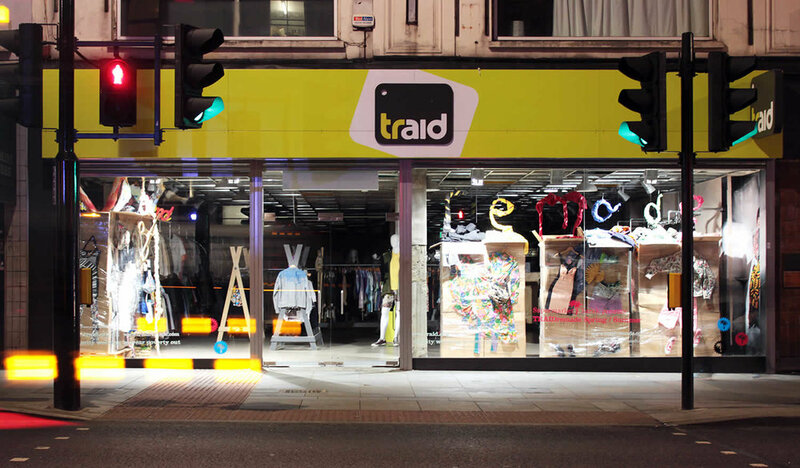 TRAID’s bold high street identity helped the charity find its niche. How has the ethical landscape changed since then? It’s changed for the better in many ways, most especially in terms of awareness of the environmental and social impacts of our clothes. Today, there are many more people, organisations, campaign groups and sectors involved in a growing conversation around the need to stop producing and consuming so many clothes. But - and it’s a big ‘but’ - it’s also much worse. Fast fashion dominates high streets and instagram feeds. It’s a monster that demands to be fed - and we keep on feeding it. There’s been a massive growth in the production, consumption and disposal of clothing, and it’s now the fourth most environmentally damaging sector in the world. Put simply, we are producing and consuming too many clothes. Where TRAID is so strong is that we offer a genuine alternative to the high street. For 20 years, we have consistently advocated sourcing more of our wardrobes secondhand. We’re still advocating for that today. Does it feel like the rest of the world has finally caught up? I recently came across an old magazine article from 2003 in which TRAID and Pesticide Action Network UK (PAN UK) were both featured. TRAID talked about the environmental urgency of reducing consumption by sourcing more of our clothes second-hand, while PAN UK highlighted the devastating impacts on cotton farmers and the environment of using hazardous pesticides on what they described as the most toxic crop on the planet. Fifteen years on, clothing production has doubled; the UK is now the biggest consumers of clothes in Europe. The impacts that TRAID and PAN UK raised back then matter more than ever. However, these issues are becoming much more visible. Now, in 2019, for the first time ever, MPs are calling fast fashion to account. The final damning report of the Environmental Audit Committee clearly states that overconsumption and climate change are driving mass extinction and that we urgently need a new model for fashion that doesn’t exploit people or planet. I couldn’t agree more. Alex Noble’s designs for TRAIDremade. Tell me about the birth of Traidremade, the fashion line. I founded TRAIDremade in 2001 when I worked at Wembley warehouse, where clothes passed on to us are hand-sorted by our team. I was looking at all the damaged jeans that we couldn’t sell and just thought, what a waste. So, we made them into something else. It began with turning unsellable jeans into denim bum bags. I put a £10 price tag on them and they flew out the door! By 2002, we were making clothes, from printed tees to reconstructed suit jackets, and selling them in Topman Oxford Street and then through more of their stores. People hadn’t really seen obviously up-cycled garments in retail stores before, so it felt new and exciting. Over the years, TRAIDremade has had many incarnations, from fast and loose up-cycling, to reusing high end fabric rolls to ethically make beautiful coats and suit jackets in British garment factories. Our most recent TRAIDremade collection was created by my lovely friend, the fabulous designer and artist Alex Noble. It was stunning. However, since our last collection, we decided that there is enough stuff in the world to use, so why make more? I don’t want anything to dilute TRAID’s core message which is to keep our clothes in use for longer by sourcing second-hand and passing on what we no longer wear or need. Which of Traid’s projects are you proudest of? A really significant moment in TRAID’s history came in 2009 when we became the first UK charity to commit our funding exclusively to international development projects supporting sustainable production in the fashion industry. It’s a beautiful circle that sees our work to reuse clothing benefitting the people and places making our clothes. Since then, we have committed millions to projects including supporting cotton farmers to grow organic, to stop child and bonded labour in our fashion supply chains, and to help garment workers to access their rights. TRAID’s work to increase the market for organic cotton is one thing I’m most proud of. It’s hugely important to support the scaling up of organic cotton production as moving from non-organic to organic cotton is the single, most environmentally beneficial change retailers can make in their supply chains. We need to make more organic cotton available in global supply chains to achieve that. 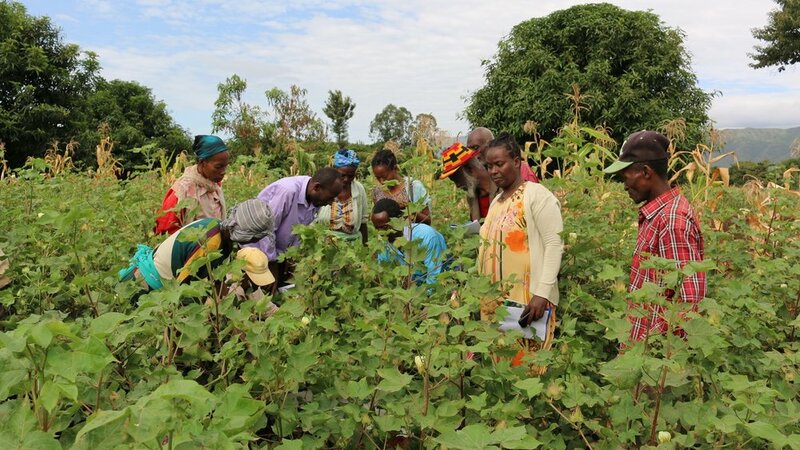 Training cotton farmers to grow organic at Farmer Field School in Ethiopia. The very first textile project TRAID funded was with PAN UK to support cotton farmers in Benin, West Africa, to transition from using hazardous pesticides to growing organically. It’s been incredibly successful with big increases in yields and incomes. Not only do Beninese farmers spend less on chemical inputs, they are now getting extra income from organic rotation crops such as shea and cashews. And, of course, reducing pesticide use has huge health benefits for farmers, their families and the wider community, and for the soil and environment. It hasn’t stopped there. This project model is being successfully replicated in Ethiopia where, last year, 200 farmers became the first ever in the country to be organically certified. For me, one of the most exciting and hopeful outcomes of this project is that farmers growing organically have reported that bees have returned, which means they now have hives and honey. How does Traid reach younger generations? We need to make the shift from talking about the need for change, to actively being the change. For that to happen, education needs to be at the heart of everything we do. TRAID set up its educational team in 2004. A huge proportion of our work is with young people in schools, universities, youth groups and communities. We deliver workshops, discussions, resources and projects to challenge attitudes to clothes consumption, to understand how clothes are produced, and what we can do to change how we consume. It's critical that the younger generation becomes part of the solution. They will be hit by climate change hardest and are most in the grip of the massive pervasive influence social media wields on their consumption choices. TRAID supports Ethiopian cotton farmers to establish small enterprises. To counter this, TRAID transform often-hazy ideas young people have about fast fashion and the people who make our clothes in faraway places into concrete realities. Educating about the true costs of fashion and consumption has a profound influence on young people. And, more than anything right now, we need to harness their passion, energy and activism to create a better future. How can we address increasing levels of unsustainable consumption? Voluntary corporate social responsibility isn’t working. It simply doesn’t address the systemic problems of massive environmental damage, endemic labour exploitation and more. The industry has been unregulated for too long and we urgently need legislation, not voluntary codes, to curb the excesses of the fashion industry. Rampant growth is a crude ruthless mentality that threatens humanity and our environment. So, it was excellent to see the need for legislation recommended in the EAC’s final report. The next step will be to turn that recommendation into a reality. More and better education is also a key way to address unsustainable consumption. A recent survey revealed that 17% of young people would not wear an outfit again if it had been seen on Instagram. The influence of vloggers, YouTube and social media must now be turned to become a positive voice on how to be more sustainable and to get people to turn their back on fast fashion. There’s no choice. We must stop increasing levels of consumption and production. The future of fashion must be about being kind. Let’s make it fashionable to do the right thing. Imagine a world where consumers, suppliers, buyers and shareholders worked with caring, humanity and kindness as the bottom line. That has to be the future. What’s a top tip for giving your clothes longer lives? Try to buy clothes that stand the test of time. Look for good quality second-hand clothing using high quality fabrics. I’m also a big advocate of debunking the myth of wearing clothes once and then washing them. Your clothes will last much longer if you wash them less. Find your local clothes and shoe repair shop and support them. At the end of a season, I get my most valuable items such as cashmere coats dry cleaned (with a chemical free dry cleaner) and wrapped up until the winter comes around again. I also have items taken in or let out if I expand or shrink! It’s also never too late to learn some new sewing and darning skills, or just learn to love the holes and imperfections that make our clothes unique! Buy less, buy better, buy second-hand.